When I was a kid there were no bird vets. This was the 50s and 60s – no medical care for any birds. Vets were not trained to deal with birds and the science of treating birds was primitive to totally absent. When I was a kid Stroud’s Digest on the Diseases of Birds was about the best book on bird medicine. To the eternal shame of the veterinary profession, this book was written by Robert Stroud, the Birdman of Alcatraz. He was an uneducated murderer who taught himself bird care while in prison. You remember the Birdman of Alcatraz, the black and white movie of his life starring Burt Lancaster. 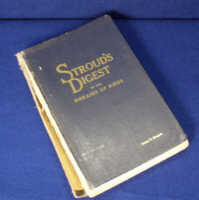 Stroud’s Digest was published in 1942 and is still considered a key book on bird diseases and is still available on Amazon. Consider this; penicillin the world’s first antibiotic was not generally available for people until 1943. Thus, Stroud’s Digest pre-dates antibiotics, yet is still the classic in its field. As I was growing up, Taronga Zoo used to refer people with sick birds to me (I never asked for this, and hated it, but couldn’t turn a sick bird away). This was from 1960 to 1964 (i.e. between the ages of 13 and 17). There was simply no good vet to send people with sick birds to. Harry Cooper and I were good mates, but he was still an undergraduate vet in those days. It would be some years before vets with good skills in treating birds would appear. A young Rob Marshall used to come around to my place too. I have no idea if Taronga Zoo sent people to Harry’s or Rob’s places. Eventually I asked them to stop sending people to me. I felt it was not proper for an unqualified person to treat sick animals (albeit for free). I mention this to create some perspective on avian medicine. Since the 1960s enormous progress in avian medicine has occurred and both Harry and Rob have played a considerable part in it. Now we have many antibiotics and many specific drugs for particular diseases. Now birds can be anaesthetised – back in the 1950s and 1960s ether or chloroform killed birds stone dead. Modern anaesthetics for birds were quite a way off. So I had to operate on conscious birds sent to me by Taronga. Primitive stuff this. I suppose that we are now entering a new phase of bird medicine. While antibiotics and other drugs are wonderful aids in bird medicine, they rather miss the point. An era based on a lonely prisoner (Stroud was in solitary confinement for 42 years!!) in a dark and dingy cell is perhaps coming to an end. The budgerigar is a “live fast, die young” species. In good years in the wild they breed up in tens of millions. In bad years they die in tens of millions. The individual bird is not important: the huge reproductive capacity of the species is. 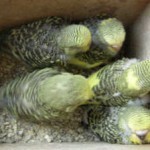 Whereas the human species produces one precious baby at a time, budgies breed 6-9 babies in a nest. Each human baby has a wonderful ability to survive injury and disease because that one baby lives a long time and matters and also has a family that will look after it when it is ill. Each budgie baby is expendable. In the wild, if they get sick, or hungry or thirsty they die. The individual budgie lives a short life and it, as an individual, doesn’t matter. Savage stuff. But budgies work hard at surviving. They travel vast distances to find food and especially, water. They have a good immune system and this is what underpins their survival. Not recovery like us, but avoidance of disease by using nomadic habits (to avoid contact with disease) and also by using their excellent immune system. 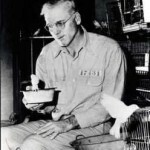 But what do we do, well we copy the Birdman of Alcatraz: we put birds in dingy, dark areas in close contact with dozens or hundreds of other budgies. We send them to the National Show where they get put in aviaries with hundreds of other birds where they share diseases. We go to auctions and buy birds from all over Australia, thus bringing more and more new diseases into our aviaries. Then we wonder why our birds get sick or fail to breed. In dingy, dark areas, the immune systems of birds simply fail. For their immune systems to work, birds need daily sunlight. Not through glass, clear plastic or fibreglass but direct sunlight. This turns the oils on birds’ feathers into Vitamin D which drives their powerful immune systems. The oil is spread by the beak from preen gland near the base of the tail as the bird preens its feathers. This oil is turned into Vitamin D by sunlight and goes back into the bird’s mouth as it preens later on. My new study of budgies’ feet may indicate another part of the puzzle. As our poor little birds languish in their dark, cave-like aviaries they struggle to produce any Vitamin D. Much as white (or lighter) skin in humans was caused by us moving to the colder zones in the northern hemisphere, the ever pinker feet on budgies is exactly the same. Dark skin stops light penetration into the skin and therefore lessens Vitamin D production. In the tropics where humans ran more or less naked, black skin protected the skin from cancer but still permitted enough Vitamin D production. As we moved into Europe, with only our hands and faces exposed to the sun, our Vitamin D production dropped and only lighter-skinned people survived. The same goes with budgies. Increasingly, dark blue/grey feet are disappearing. It’s not recorded, but I’m sure that Vitamin D production must occur in budgies feet. So lighter-coloured skin on the feet compensates for dark aviaries. Check your birds for foot colour. I’ll bet that you will be surprised how many have lighter-coloured feet. Some people have said that the lighter-coloured feet are because the birds are split dilute or cinnamon or whatever. My tests show that this is not statistically valid. These birds may or may not be split for all sorts of things. Equally, this may explain the decline of normals and the rise of cinnamons, lacewings, albinos etc. Birds with pink feet should be healthier and normals which tend to have darker feet should be less healthy in dark bird rooms. In humans, redheads are recorded as having powerful immune systems for much the same reason. Light skin produces more Vitamin D which drives the immune systems. So, Stroud got it wrong. In a dingy, dark cell, the birds’ immune systems were all but destroyed. So he dealt with that situation as if it were normal. It wasn’t. Most vets still think like Stroud. Relying on antibiotics to cure and control diseases in budgies (much as we do with humans) just doesn’t make sense. Humans are designed to recover but budgies aren’t. Relying on antibiotics alone with budgies is quite simply ineffective. The truth is that prevention is 100 times better than cure, since birds often can’t be cured. We all need to focus on creating powerful immune systems in our birds. The situation with megabacteria really shows up the problem. 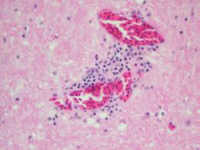 Megabacteria is really Avian Gastric Yeast – that is, normal digestive organisms. Vets should have said, “If avian gastric yeast is a problem, then you must have impaired immune systems in your birds.” Avian gastric yeast is part of all healthy budgies’ digestive systems. If it starts to cause problems this can only mean that the normal immune system of the bird is compromised. You don’t treat megabacteria; you treat the bird’s immune system. Since I bumped up Vitamin D production in my birds, megabacteria, as a problem, has totally disappeared, never to return. I increased direct sunlight, added Sylvania Reptistar lights and used Soluvite D Breeder (tonic). We can all be confident that the next ten years or so will see many improvements in methods to strengthen birds’ immune systems. Interferon, more Vitamin D etc. etc. and maybe less of mixing our birds together. 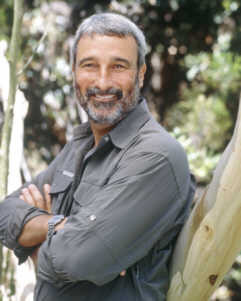 Don Burke lives in Sydney, Australia and is a qualified horticulturist and arborist. He started breeding budgies in 1955 and specialises in rare varieties such as Clearwings, Blackeyed Whites and Yellows, Darkwings and Australian Goldenfaces. He is patron of the Clearwing Budgerigar Society of Australia and is President of the Miniature Budgerigar Society of Australasia. Hi Kelli, I apologise for not making my point clearly. Normals are supposed to have dark purplish-grey feet, but many don’t:they have pink feet. All varieties that are supposed to have dark feet are starting to show many with light-coloured feet. My research has proven that this is often NOT due to being split for cinnamon etc. My theory is that it is an adaptation to dark birdrooms. Go and check the feet on your normals. Since I wrote this article, new independant scientific research has proven my theory about birds’feet producing Vitamin D to be correct.